SH-5PDF Hydraulic Punches: Izumi Products. 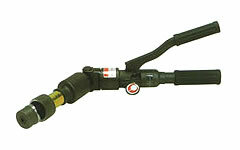 The SH-5PDF is a portable hand hydraulic punch with swivel head for easy access to tight quarters. It gives clean perforation through 3.2mm thick mild steel with a 3" hole. SH-5PDF None, SH-5PDF(A) A19-A51, SH-5PDF(B) B16-54. 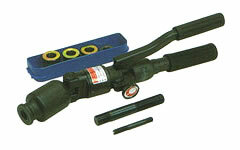 1, SH-5PDF hand hydraulic punch. 2. Set bolts (3/8", 3/4"). 3. Collars (Large, Medium, Small, Ex-small). 4. Steel carrying case.